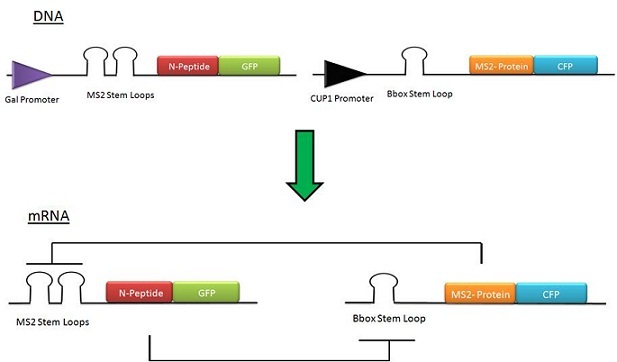 For iGEM2010, our team decided that the biology project would aim to produce a genetic toggle switch, which operated by controlling gene expression at the translational level. To implement the switch, two gene expression constructs were established, each consisting of an RNA-binding protein fused to either Green (GFP) or Cyan (CFP) fluorescent protein. When co-expressed in yeast, these translational fusions would be mutually inhibitory at the translational level, thereby forming a biological, ‘Toggle Switch’ system as shown by diagram 1. We have called this the ‘AyeSwitch’ and it is regulated by controlling the two constructs via different inducible yeast promoters, either GAL1 or CUP1 via the presence or absence of galactose and Cu2+ ions respectively. Would this switch exhibit ‘bi-stability’ (i.e. could it switch from one state to another and back depending on the inducer present). Would this bi-stability switching be dose dependent. What would happen if both inducers were present in equal concentration and length of time. Could the bi-stability sensitivity be ‘fine-tuned’ using different mRNA stem loops and binding proteins. Since this translationally regulated toggle switch is a novel design, the project started with pilot experiments to determine the promoter responses to their respective inducing agents. This was successfully achieved using the genomically integrated constructs in which GFP gene was placed under the control of GAL1 or CUP1 promoter. The results are described in the promoter characterisation section results. Following this, we set out to test the two central constructs of our project (see Fig 1 above). As explained in the Results section, only one of these (GAL1p-[Npeptide-GFP]) was successfully expressed Switch characterisation . As a result we characterised the dose - and time-dependent induction of GAL1p-[Npeptide-GFP] using FACS analysis and fluorimetry. Following this, as described in the Switch troubleshooting section, we carried out a series of carefully designed cassette replacement experiments to identify the component in the CUP1p-[MS2-CFP] construct that was preventing CFP expression. This involved microscopy and fluorimetry (see Troubleshooting CUP1p-[MS2-CFP] Troubleshooting CUP1p-[MS2-CFP]). From these experiments, we concluded that the Bbox stem loop or fusion of MS2 coat binding protein to CFP may have prevented the expression of CFP. However, we were able to show using the construct MET17p - [MS2], which was available from the host lab, that translational inhibition of GFP expression via the binding of MS2 coat protein to its corresponding stem loop was possible (see Characterising the translational repression of GAL1p-[Npeptide-GFP] by trans expression of the MS2 protein ). This suggests that the toggle switch is a viable design.